FLAG stands for Friends of Lesbians And Gays. FLAG is a support group by the students for the students. Objectives include, supporting each other, creating a warm inviting atmosphere, to create awareness, to build a sense of unity and a sense of community, to celebrate, and of course to open minds. FLAG is not just for those who are Gay or Lesbian. ALL ARE WELCOME TO COME! 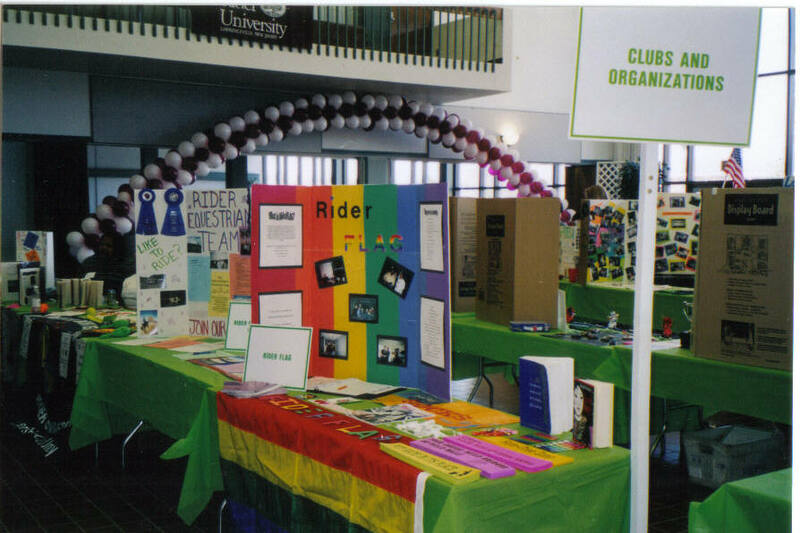 FLAG is an organization of students who try to work together with the support of faculty and staff to provide a comfortable atmosphere at Rider. The meetings tend to be very loose. Everyone is welcome, and showing up to a meeting does not define your sexuality. Remember, this group is meant for ALL. We also understand and respect that everyone is not out and not open, so we do not ask you to reveal your sexuality, nor do we force you to be out about it either. Meetings are open to all sexualities, and even to those who do not attend Rider. What do you guys do at meetings? The meetings usually vary. Anything can happen, and we tend to have a loose outline, leaving room for discussion or any other topics that may arise. Some informative,educational, and serious meetings will exist. We tend to keep things light though. Movie nights and game nights will also be scheduled in too. We tend to make things fun, and we are always open for suggestions.